Buy Chickens, Not Prozac: Can Technology Bring us Back to a Simpler Time? By Community Chickens on October 27, 2010 Visit Community's Website. Hi there, my name is Jennifer Sartell and it is a pleasure to begin this new adventure in blog writing for Community Cluckers. My husband, Zach, and I run a small hobby farm where we raise Angora Goats, Angora Rabbits and, of course, chickens. We call it Iron Oak Farm. “Iron” because Zach is a blacksmith and “Oak” because we live in the woods of Oakland County, Michigan, where the dominant tree is the oak. I wanted to start this post by telling you a little about how we approach this world of chicken raising. Perhaps there’s no better way for you to get to know us, than through a story that in a sense, explains where we’re coming from and why we raise chickens. Zach and I visited Greenfield Village this past summer. It is an amazing historic attraction in Michigan, our home state. They have live demonstrations like blacksmithing, glass blowing, weaving, etc. There are small working farms with sheep, horses and of course my favorite, chickens. It is a glimpse into this country’s past and helps us to see where we’ve come from, and reflect on where we are going. 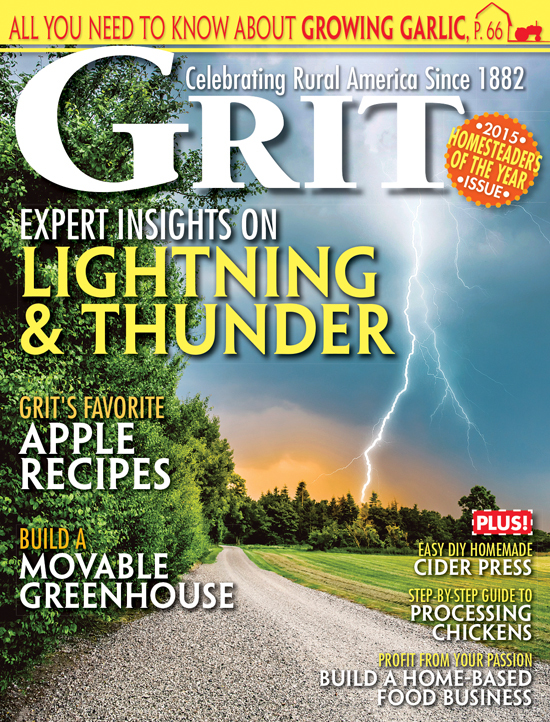 To a couple like us, with a standing motto of “live simple,” this small wonderland brings you back in time where the romantic, “Laura Ingalls” side of me longs to have lived (the more logical side appreciates modern conveniences like indoor plumbing). We wandered into the Thomas Edison building, where a man in historic clothing explained the wonders behind Edison’s discoveries and inventions. I was enjoying the demonstration when an ironic thing happened. I looked to the left of me to see a small boy holding the latest hand-held video game. This young man was miles away from the small clapboard building where the light bulb was invented. The curator who explained the inventions of Thomas Edison was no doubt a faint mumbling, resembling the muffled voice of the teacher in Charlie Brown. This boy was more interested in collecting pixilated coins and getting to the next level in his game than learning the very source as to where the invention of games like he was holding came from. I tell you this story not as a tragic commentary on today’s parenting skills, but to bring up an issue that I struggle with everyday; where does technology fit into a simple life? This question is at the heart of the very reason why I raise chickens. I’m not the only one who is trying to choose a side in this lucrative argument. There is much discussion nowadays, which leads me to think about where we are headed as a society. In a world where technology is moving forward at lightning speed and everyone is racing to get the next best device that makes an already fast-paced world even faster, I feel as though I am tripping over my own feet to catch up. As the speed and convenience of technology becomes available to us, it also becomes expected and ingrained in our daily lives. We’ve been taught that we can’t live without it. Juxtaposing this, we also have a giant movement that is taking people back to simpler times. There are community gardens sprouting up everywhere, co-op farming, farmers markets, whole foods movements, and home schooling is on the rise. “Nationally, the United States Department of Education says the number has swelled to more than a million kids,” according to www.msnbc.com. Among these movements is the backyard chicken movement. I’ve witnessed this increase firsthand. When I first got chickens about 15 years ago, I would tell people and they would look at me like I had a third eye coming out of my forehead. “Chickens? Like REAL chickens?” But it’s come a long way, just this past spring, six of our close friends happily added flocks of backyard chickens to their family. So how does this all flush out? How can we be moving forward and backward at the same time? I look to my husband as a person who encompasses this entire argument in a single being. He is irony at its best! 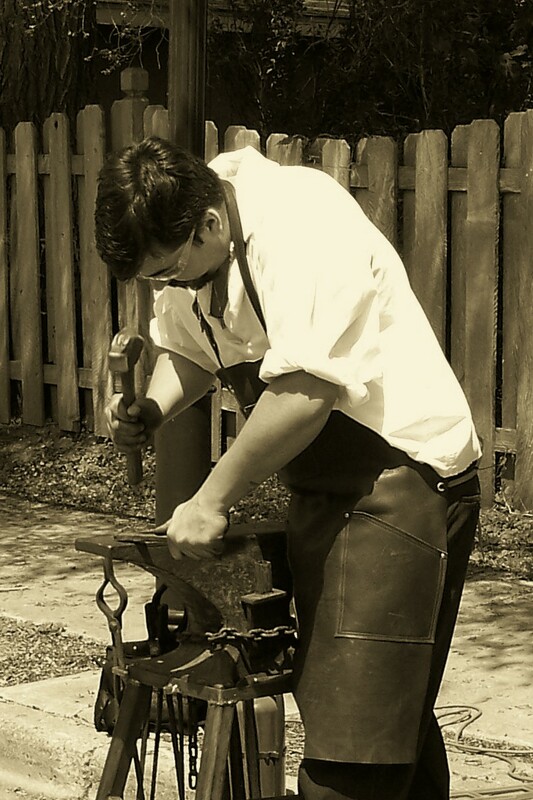 By day he is an IT Provisioning Analyst, by night, a blacksmith, and not just any blacksmith, but one who dresses in turn-of-the-century clothing and gives demonstrations with his “pioneering wife” (that would be me), bonnet and all. We’ve had people approach us and ask if we are Amish. I have to admit that it’s sort of satisfying that our attempt to be authentic is well received, but I can’t help feeling a little bit guilty. You see, I have a secret. It’s called the Internet. Where did I get my “bonny bonnet”? It sure as heck wasn’t Walmart. I found a website that sells pioneering clothing. Where did Zach buy his antique drill press? Craigslist. How did we learn how to shear our Angora Goats? YouTube. And it doesn’t end there. I’ve raised chickens with and without the Internet, and let me tell you, I’m sure that our current flock is very happy that we have a computer. Raising chickens, though it’s gaining recognition, isn’t exactly common yet, and the physical literature that goes along with this venture is far and few between. I’ve had chickens since I was about 15. I was not raised on a farm, or in a farming community for that matter, I wasn’t in 4-H, my parents were not farmers. In fact, sometimes I think they think I’m the mailman’s child. I grew up in the woods, the scattered remnant acres of dense old growth deciduous forest, where it’s hard to get a blade of grass to grow, let alone rows of corn. My fascination with chickens came from the books I read as a child, and I took this fascination one step further one day when my dad and I went to the local feed store to get bird seed and they just happened to have a bin of broilers for sale. I begged and pleaded, and whined and with MUCH hesitation my dad let me get 4 chicks. The only advice we got from the shopkeeper was, “Don’t feed them too much, because they’ll outgrow their legs.” Hmm … ok …very helpful. 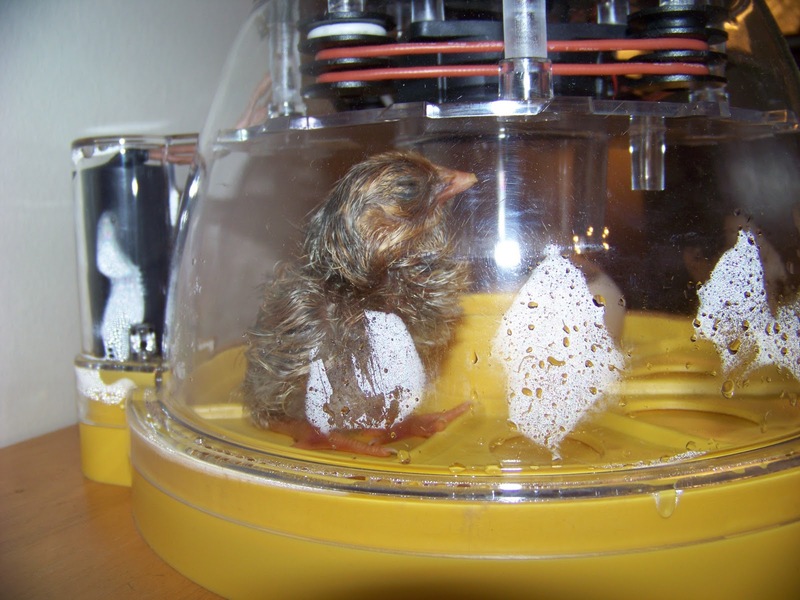 The excitement I felt that day is not any different from the excitement I get now when I bring chicks home, or even better, when we hatch them ourselves. I pictured myself rising each morning to the rooster’s crow, gathering eggs in an egg basket and the joy that comes in the everyday care of these quaint little creatures. But oh, the things I’ve learned! My first flock was raised on corn. Corn because that’s what my dad said he thought they ate, and there was no one to tell me different. Once they feathered over, we kept them in an empty dog kennel. They lived three nights before a weasel crawled through the cyclone fence and with harsh realization, we suddenly understood why “chicken wire” was so aptly named. Over the summer we built a respectable coop and using the phone book (you remember the phone book, right?) I had found a small store close by that got in all sorts of different types of chickens. At this point, I didn’t even know there were different types of chickens. We were informed that there was, in fact, a “chicken food” called crumbles and that the list of chicken breeds seemed endless. We picked up an assortment of chicks, Polish, Silkies and a Bantam rooster that ended up being a Mille Fleur. I set it in my head that I was going to do right by these chickens. Collect as much knowledge as I could and have the happiest flock around. Granted, at the time, I had the only flock around, but nevertheless … I went to our local library only to find that most of the chicken raising books were from the late 1960s and were more or less conversion charts that explained the costs of feed to meat production, not exactly what I was looking for. It was right about this time when the Internet started rolling through households. We’ve always been a little behind on the technology wagon anyway, but in due time, we signed up for dial-up and the world of chicken raising opened up for me. I could suddenly look up breeds and colors, feed suggestions, symptoms and cures, disease prevention, the information was endless. As I’ve gotten older and more knowledgeable I feel bad for the first trial and error flocks of chickens I raised. I’ve realized SO many things I did wrong. Needless to say, the information that I gathered before we had the Internet crawled along. For a stamp collector, maybe that’s not such an issue, but to someone who “collects” live animals, the information on the web is priceless not only for the reassurance and pleasure of the farmer, but for the well-being of the animal. We are blessed to have the technology at our fingertips even if we use it to do “simpler time” things. My husband and I raise chickens. It is not just a hobby, it is a way of life. It brings us simple pleasures. There is nothing more relaxing than listening to the quiet cooing of our pair of bantam cochins. Or the joy it brings when one of our chickens finds that special something, whether it be a bit of leaf, a moth, or an acorn cap and runs around with it in its mouth with a trail of chickens behind trying to find out what they’ve found. Talk about “lol”! The Internet has opened our eyes to so many different aspects of chicken raising, once again it has struck a tone of irony on our own farm. After finding the American Livestock Breeds Conservancy website, we’ve been changing our focus and concentrating on raising some of the Heritage Breeds. The Internet opened our eyes to these rare breeds of “old tyme” chickens and without the advancements in technology, we wouldn’t have known that there was a need to step back and re-look at these diminishing breeds. So, does it annoy me that they’ve installed televisions at gas pumps so that we can be entertained in the five minutes it takes to pump a tank-full of gas? Yes. But maybe this is a small hurdle in the process of turning our lives for the better. Maybe the lighting speed that technology is moving is transporting us, in a sense, back in time. Anyway you look at it, there is a balance that must be struck. Moderation is the key. If you’re considering getting a flock of your own, chickens are amazingly simple and easy to care for, but it’s important that you know what you’re doing. There is so much to learn about these fascinating little birds. And much pleasure to have from raising them. We are blessed to live in a time where technology gives us the freedom to choose, and the knowledge to bring hobbyists together and learn from each other and how to do best by our animals. Visit Jennifer Sartell’s website at Iron Oak Farm. Thank you so very much! It’s refreshing to hear that other people are also noticing this occurrence. Liked your post about blending the best of the new and the best of the old. We don’t have to choose either/or, we can have both. This article embodies my personal reflections on my experiences as well. There does seem to be a disconnect between technology and nature. Excellent post! It is very well written and your pictures are great.